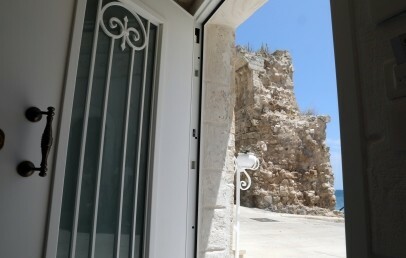 Just a few paces from Cala Porta Vecchia, at the edge of the historic centre of Monopoli visitors will find the Miramare Luxury Guest House, which offers a splendid view over the city walls and a crystal-clear sea. In just 200 m visitors can reach the town’s Cathedral. The nearest airport is Bari (53 km) while the airport of Brindisi is about 70 km distant. 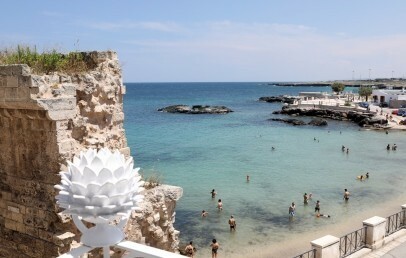 The nearest towns are: Polignano a Mare 8 km, Ostuni 25 km, Alberobello 25 km, Matera 70 km and Lecce 100 km. Obtained from the careful refurbishment of a period residence, the Miramare Luxury Guest House offers stylish suites with a view and exclusive design furnishings. 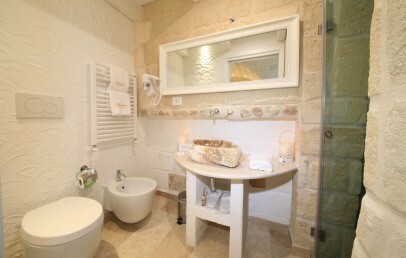 The Hotel offers guests a panoramic terrace, ideal for relaxation in the small jacuzzi pool. The Hotel welcomes children starting from 14 years of age, sorry, no pets. 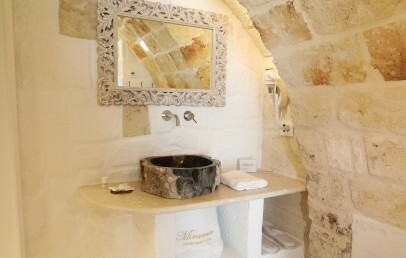 The authenticity of artisan stonework, modern design, stylish, sophisticated furnishings mark the 4 suites of the Miramare Luxury Guest House. Beds have king size mattresses, which are round in the Suite Queen and Suite Luxury, so separate singles are not possible. All rooms are doubles, without the possibility of adding a third bed. All Suites have free Wi-Fi connection, mini-bar, AC, Smart TV 50’’, King size bed, heating. The beach fronting the hotel, rocky but with a strip of sand, is public and not equipped. Guests can request Reception to provide details on how to reach the equipped beach (payment required) which is some 700 m away, again consisting of rocks and sand. On request, private transfer to the beaches can be arranged. In the morning, a typical Italian/Mediterranean/continental breakfast is served; gluten-free products available on request. There is no restaurant service for lunch and dinner, but staff will be happy to provide details of – and bookings for – nearby restaurants. On request and with payment, the Hotel can handle transfer services, limousine service, massages, hair-dresser-beautician, provision of pastries, cakes and floral compositions for special occasions, boat tours (yacht, sailing boats, catamaran), cocktails, restaurant bookings, rental of push bikes/cars/scooters, laundry service. The historic centre in which the Hotel is located is pedestrian-only. A public parking area is available free of charge in the vicinity; alternatively, private parking is available, at € 30.00 per day. Guests should alert the Hotel 15-30 minutes before their arrival, to receive assistance with parking and baggage handling. Reception is open exclusively from 09:00 to 21:00. Check-in is between 14:00 and 20:30. Late check-out is possible up to 15:00 hrs but only with prior request and payment of € 50.00. Smoking is not allowed in the Suites but is possible on the balcony and terrace. With prior request, guests may utilise the services and terraces of the other structures belonging to the same Group, the Hotel Playa del Mar and Hotel Bellavista. Double room with king size bed, stylish and elegant, marked by olive-wood beams supporting the splendid vaulted ceilings. En-suite with hydro-massage and balcony with sea view. Can host a maximum of two persons. 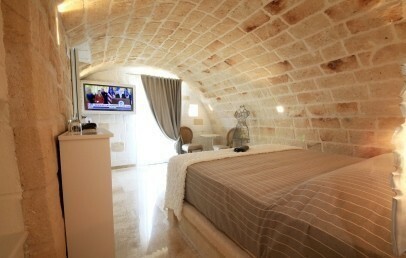 A double room with King size bed, stylish and elegant, with walls in local natural stone and charming wooden beams. Hydro-massage pool in the room and balcony with sea view. Can host a maximum of 2 persons. En-suite with shower, free Wi-Fi connection. 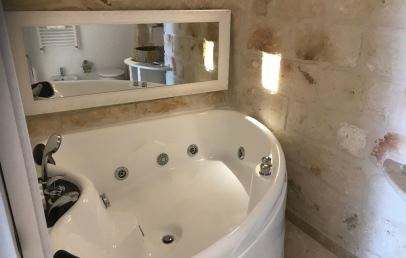 Double room with King size bed, stylish and elegant, marked by splendid stone vaulted ceilings and a pool of 10 m2 in the room with hydro-massage and chromo-therapy. En-suite with shower, free Wi-Fi connection. 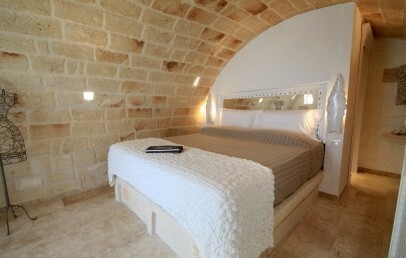 Double room with King size bed, stylish and elegant, marked by barrel vaulted ceilings in tuff and bed structure in stone. Small balcony with sea view, en-suite with shower. Free Wi-Fi connection.